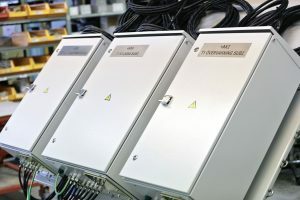 Flexible and reliable production of switchboards and control cabinets. Switchboards, automation cabinets and control cabinets of all size classes – delivered reliably and flexibly. Escarmat has over 20 years’ worth of experience of long-term cooperation with world-leading companies in the electrical and energy industries. In addition, our top-quality services are trusted by numerous automation and machine manufacturers. We produce and test various kinds of cabinets. If you wish, we will also design and install the cabinets for you. We can purchase the required components from suppliers chosen by you, or we can use our own suppliers. Thanks to our long-term relationship with our components suppliers, we can guarantee inexpensive production of cabinets, which always comes with a professional human touch. Top-quality contract manufacturing is always built upon an open and flexible partnership. Don't hesitate to contact us with any questions you may have regarding your order. If changes need to be made along the way, we will take your requests into account without any delays in the delivery schedule. 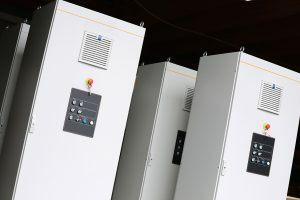 Each year, we produce thousands of cabinets for various different uses, ranging from large power plant cabinets to small feedthrough terminal cases.